Just when I think I'm done with ripped jeans, Balmain comes with a stunner. 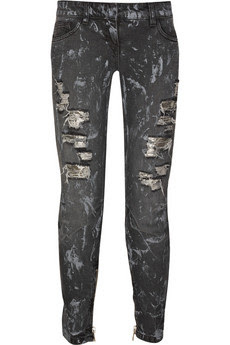 These jeans are so dope because in between the rips there is exposed chain mail. Giving you a hidden bionic leg! The cropped length jean is everywhere for Spring and a great style because it guarantees that those Haute summer sandals can be on full display. 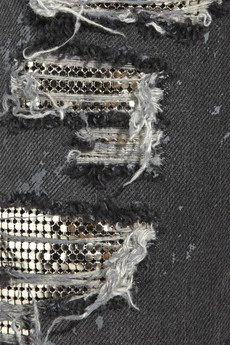 The jeans are paint splattered and have a zippered cuff, as usual designer Christophe Decarnin leaves no detail undone. These rock on their own so keep it simple with black tank or T-shirt. Fab!